There aren’t many things I love more or find more useful than a chic tweed jacket. 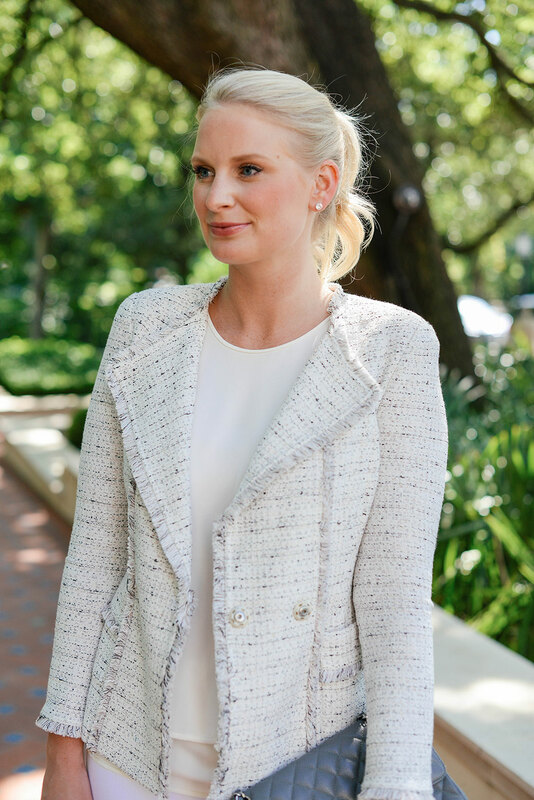 You may remember my Proenza Schouler tweed jacket (styled here, here and here) – I wear it constantly. It instantly transforms any outfit into a stylish, sophisticated ensemble. If you need more proof of how versatile a tweed jacket can be, I’ve worn the Proenza Schouler jacket to drinks with friends, on the plane, and to a conference. Fun, travel and work – all in one piece! Because I’ve certainly gotten my money’s worth in my Proenza tweed jacket, I wanted to find another one in a different color scheme that compliments the lighter neutrals in my closet. I decided on this one from Nordstrom – isn’t it gorgeous? 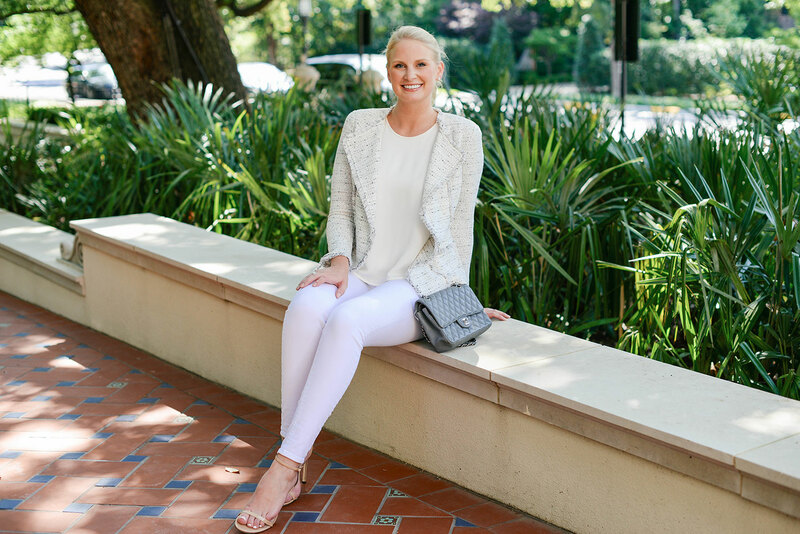 The jacket is ivory with stitching of light and dark grey – while I’ve styled it with white here for summer, I’m sure I’ll wear it all fall/winter with my new grey FRAME jeans and black leather pants. Loving the peplum detail on this bright red piece! On the hunt for a party-perfect cocktail jacket? Try this one. 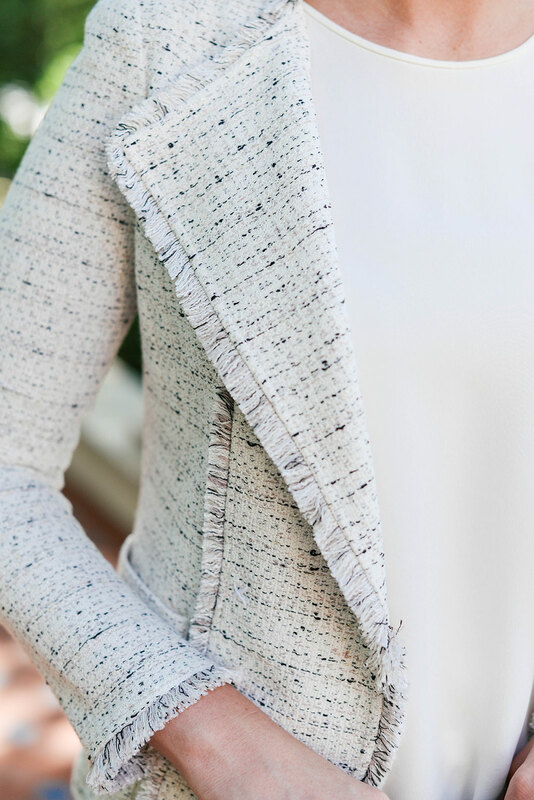 This 3/4 sleeve jacket is light and lovely for summer. This jacket reminds me of Proenza Schouler’s Fall collection a couple years ago – black + dark turquoise tweed! You can never go wrong with classic black. Shop more of my favorite St. John pieces below! This jacket is amazing, gorgeous look! Love this classic jacket! You can style it so many ways and it will always look polished and pulled together! Definitely a timeless staple! This is just beyond chic! Loving how you paired it with classic accessories as well! What a gorgeous tweed jacket! Love it with the white jeans but it looks like it would be adorable with a dress or skirt, too! Love this classic look! Your hair looks so cute pulled up in a pony! I really love those white pants! I’m in the market for a great new pair. I love this outfit, it’s so elegant and chic! Very stylish outfit – I love tweed jackets too! Such a beautifully classic look, Merritt!